Arash Feiz 3 months ago. Android Oreo 8.1 ROM, LineageOS 15.1 for Galaxy NOTE 3 (n9005) has now arrived via a development build. This LineageOS 15.1 for Galaxy NOTE 3 (hlte) is brought to you by developer andr01dfr3ak, haggertk and another build is by EdricChan03. Lineage OS 16 for Galaxy NOTE 3 is now available from an unofficial build. – No donation link found for andr01dfr3ak, haggertk, EdricChan03. THIS IS AN INITIAL BUILD WHICH MAY NOT BOOT AT ALL OR EVEN IF IT BOOTS IT MAY HAVE MANY BUGS. HAVE A BACKUP BEFORE FLASHING THIS LINEAGEOS ROM AND TRY AT YOUR OWN RISK. Installing a custom ROM on a Galaxy NOTE 3 (hlte) requires the bootloader to be unlocked on the Galaxy NOTE 3 (hlte) phone, which may VOID your warranty and may delete all your data. Before proceeding further you may consider backup all data on the phone. You are the only person doing changes to your phone and I cannot be held responsible for the mistakes done by you. – Here is theTWRP update guide for the Galaxy NOTE 3 (hlte). Download and Copy the Lineage OS 15.1 GApps and the Android Oreo based LineageOS 15.1 for Galaxy NOTE 3 ROM ZIP file to your phone. First flash the Lineage OS 15.1 for Galaxy NOTE 3 Oreo ROM ZIP from device. Then flash the GApps for LineageOS 15.1 zip from your device memory. 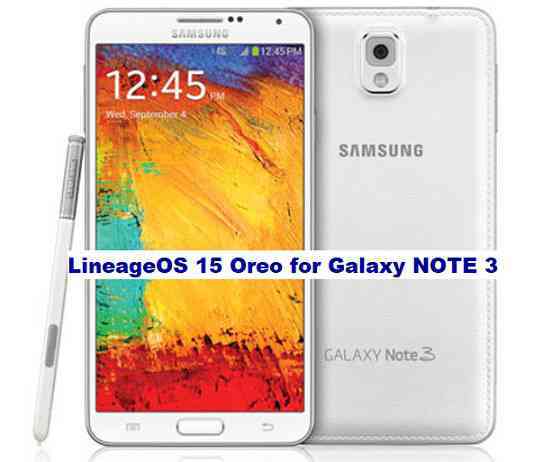 Reboot and Enjoy the Oreo 8.1 LineageOS 15.1 ROM for Galaxy NOTE 3. Copy the latest Galaxy NOTE 3 Lineage 15 Oreo ROM ZIP file to your phone. Stay tuned or Subscribe to the Galaxy NOTE 3 LineageOS forum For other Android Oreo, Nougat ROMs, LineageOS 15.1 ROMs, other ROMs and all other device specific topics. Link to andr01dfr3ak’s NOTE 3 LineageOS 15.1 build is here. hello can u fix the update script please. wen i remove the furst line into update script i get a other error code 6 how to solve dis one? I understand that it’s late to reply, but what’s the exact error do you see? Can you send a screenshot or the exact text of the error on screen? I have added a new build by EdricChan03. You may try that and see if you still get the error? Hello! On my device on all firmware 15.1 there is a problem with the rotation of the screen. With any application. Sometimes if it works with a long delay but basically it does not work at all. At 14.1 everything works fine. Can you fix it? After rebooting the system the screen rotation starts working well. It stops working after the device leaves the sleep mode. And it does not work until the new reboot. It’s possible that the application responsible for screen rotation does not exit from sleep mode. Or it is related to the energy saving mode. Please advise that it is possible to make. Is the issue on EdricChan03’s build or haggertk’s build? This is a problem for both assemblies. First I installed the assembly haggertk’s lineage-15.1-20180506- then after full wipe and formatting the internal memory I installed the lineage-15.1-20180805-UNOFFICIAL-hlte.zip assembly from EdricChan03’s. Problem still exists. Now I found out that the problem of screen rotation all the same is not directly related to the sleep mode. This arises arbitrarily. There is no exact pattern. Also I noticed sometimes when you exit sleep mode all the icons on the desktop are not displayed. If you turn the screen off and then on again the icons appear. I have added a new download link to andr01dfr3ak’s LineageOS 15.1 build for NOTE 3. People have reported this build is working fine without any issues for them. I hope this is stable enough. shibaa987 Thank you so much! This assembly works fine!